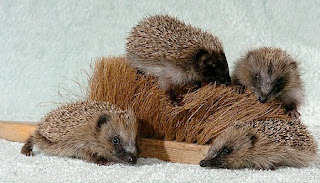 The Dailymail reports of 'four tiny orphaned hedgehogs are snuggling up to the bristles of a cleaning brush - because they think it's their mother'. It's easy to imagine such animals have poor eyesight, or that they mistakenly think it's their mother due to the texture. Relating this to customers however, and in my branding experience, I wonder how this process, which seems to me wreaking of product substitution could be exploited marketing-wise. How much of any product is potentially a substitute for other products? While we could never easily predict whether the products we create will be used for exactly the same purposes we intended for it, it's an interesting insight to know that a process of substitution has happened before in marketing history: Listerine, for instance is not initially a mouthwash but a surgical antiseptic. It wasn't a runaway success until the 1920s, when it was pitched as a solution for "chronic halitosis", the faux medical term that the Listerine advertising group created in 1921 to describe bad breath. By naming and thus creating a medical condition for which consumers now felt they needed a cure, Listerine created a market for their mouthwash. Until that time, bad breath was not conventionally considered a catastrophe, but Listerine's ad campaign changed that. As the advertising scholar James B. Twitchell writes, "Listerine did not make mouthwash as much as it made halitosis." As a marketer, having been busy ensuring current campaigns remain successful, I must admit I fail to seize this opportunity a lot of times: Do we have systems in place testing our current market for unexpected usage habits or metrics? While most companies will admit having an automated monitoring or reporting system in place for current project is a good thing (something most of us have), sometimes a simple pivot chart on raw data may reveal something new - precisely a gem that we just might miss.